Home #IndieDev JUST ANOTHER COLOR SWITCH WANNABE? JUST ANOTHER COLOR SWITCH WANNABE? No, not really. HEXO is one of the latest versions of an addictive arcade mobile game. Not only is it an addictive mobile game, there are also a lot of cool special effects (e.g. open and close animations to each and every scene.) 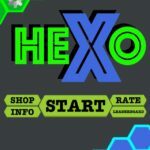 HEXO is a mixture of addictive gameplay and quality graphics. 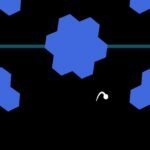 With the design, much attention has been paid to the fact that hexagons are used, (because the game is called HEXO), which is short for hexagons. HEXO is made by Poly Games, a new studio consisting of Kenneth Joergensen (a 19-year-old young man from Denmark) who after 3 years has taught himself to develop games, apps and more. Last year he entered the game development world to take over the mobile game market with the game Poly Cave. Poly Cave is a simple Zig-Zag based game with really great graphics so it looks as though you are playing in a cave. He has since released his second serious game “HEXO” which he believes has what it takes to hit the top of the mobile market. The idea came at Poly Games. Kenneth worked to make a lot of different game mechanics and examples and started by making the enemy boxes, but his friends did not like it, so he tried switching to hexagons which they all thought was pretty cool and so the name “HEXO” was obvious. Each time you tap on the screen of your device your player will jump up, and by releasing your player will fall back down. The figure you play with moves automatically from side to side and will change directions automatically when you hit the edges of your screen. But that sounds easy, right? There are a lot of obstacles that stand still, turn around and fly up and down or back and forth. The obstacles/enemies are blue and green hexagons. Does this sound more difficult? It is, although not so difficult that it is impossible. There is also some help for when it seems too difficult, any obstacles that do not move or rotate can be landed on top of which makes it possible for you to relax for a moment before you move on. But it does not stop here because there are also some mystery boxes which could give you either something good or bad. Lightning and Thunder: The whole screen shakes and flashes. Snail: You cannot jump very high for 10 seconds. Shield: You get a shield for 10 seconds. HEXO is a mobile game where – unlike other simple arcade mobile games – there is as much focus on the design and the visual experience as the actual gameplay itself. 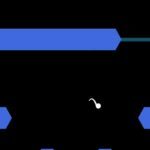 Like any other arcade game, HEXO is a one-tap game which means all you need to play is a finger and a good technique. This article was Published by Edamame Reviews, Written by The Poly Games Team.